International term life insurance for expats is a key benefit Good Neighbor Insurance provides for those residing overseas. Good Neighbor Insurance provides international term life cover for individuals and for organizations. For individual international term life cover Good Neighbor Insurance provides two policy types which may be viewed here at https://www.gninsurance.com/overseas-term-life-insurance/. The Petersen International term life cover provides coverage even including Iraq and Afghanistan. Good Neighbor Insurance can provide international term life coverage in high risk locations. Our type of international term life cover will even cover in war and terrorism situations as long as the policyholder is not part of a military or militia. Can non U.S. citizens apply for international term life policy? The rules for the term life plan are tricky. We cannot offer coverage to most non-U.S. citizens, but we can write some of them in some circumstances. The basic intent of the International Term Life policy is to cover U.S. citizens living/working outside the U.S. However, we can write non-U.S. citizens in various countries around the world, most of those countries are in Europe and the Caribbean. Am I eligible for an international term life insurance policy? Expats as well as non-income earning spouses of expats between the ages of 18 to 65 are eligible. However, it is required that expats must be employed for a minimum of the first six months of the term life insurance policy. How much coverage (face amount) should I get? According to the Life Insurance and Market Research Association, experts recommend having enough life insurance to replace income for 7 to 10 years, but each individual must calculate their beneficiaries’ future financial needs. Several factors (such as age, children, mortgage, income, etc.) must be considered to determine the appropriate amount of life insurance coverage. Clements Term Life offers a policy with no medical test required up to USD 500,000. For individuals requiring coverage over USD 500,000, a doctor’s medical report must be submitted for underwriting approval. Under our plan, coverage up to USD 4 million is available with 1 to 10 year terms. How is (medical) pre-existing condition defined? A pre-existing condition as used herein, means a condition for which medical advice or treatment was recommended by or received from a physician or other health care practitioner at any time during the thirty (30) month period preceding the inception date of this Policy, or symptoms were present at any time during the thirty (30) month period preceding the inception date of this Policy, which symptoms would cause a reasonably prudent person to seek advice or treatment from a physician or other health care practitioner. 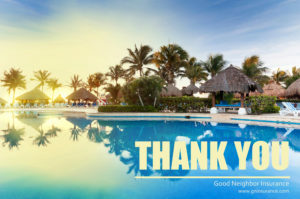 Good Neighbor Insurance, www.gninsurance.com, provides international term life insurance for expats residing outside the U.S. Please connect with one of our licensed international team members to find the best international term life cover for you and your family. You may also email us at info@gninsurance.com. Good Neighbor Insurance also provides international travel insurance for U.S. residents and non U.S. residents. Please head over to https://www.gninsurance.com/international-travel-health-insurance-plans/ for some travel insurance options.